Obituary for Mary Joan (Joan) Vercimak | Crandall Funeral Home Inc.
Mary Joan Vercimak (Joan) age 92, passed away on March 28, 2019. Joan was born on July 7, 1926 in Tacoma, Washington to Steve Rodzinak Sr. and Mary (Hiblar) Rodzinak. 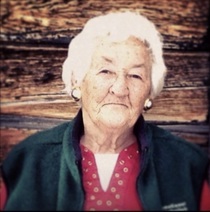 She married Stephen Robert Vercimak on June 7, 1944 in Fort Bridger, Wyoming. He preceded her in death on April 23, 1967. Joan is survived by her children, John (Robyn) Vercimak of Grover; Stephen George Vercimak of Gillette; Nancy (Kendall) Berrier, of Rock Springs; Larry (Susanne) Vercimak of Fort Bridger; Tony (Dolores) Vercimak of Casper; Jim (Jennifer) Vercimak, of Evanston; and Stephanie Vercimak (Van Capansky) of Midland, Texas. Also surviving her are 6 grandchildren and 5 great-grandchildren; also step-grandchildren and great-grandchildren. Joan was preceded in death by her husband; parents; sister Margaret Guild; brother Steve Rodzinak Jr.; and an infant grandson, Adam John Vercimak. Funeral Mass and Celebration of Life with Christian Burial will be held on Wednesday, April 03, 2019 at 11:00 a.m. at Saint Helen’s Catholic Church in Fort Bridger, Wyoming. Rosary will be on Tuesday evening at 7:00 p.m. Friends and family may call at the church one hour prior to the Rosary on Tuesday and one hour prior to Mass on Wednesday. Interment will be in the Fort Bridger, Wyoming Cemetery.